If you're at all familiar with the world of social media you've know doubt heard of Klout. I'm not hear to praise or condemn their attempt to measure and quantify an individuals success using various social mediums (social media), but to explore their recent changes to their topics lists. The use of "topics" as part of Klout's evaluation is an attempt by Klout to ascertain and make public specific topics that individuals are influential on. This is not to say that you are one of the top influencers on a given topic just because it is listed in your profile but that from all your social media posts, engagements, likes, retweets, comments, etc. and of interactions by others that they initiated that these topics have occurred highest in your data stream. Of course, Klout knows that they might be wrong and a single post that takes off might yield undo influence and affect these topics. So a few months back they allowed you to delete topics that you feel are not appropriate. 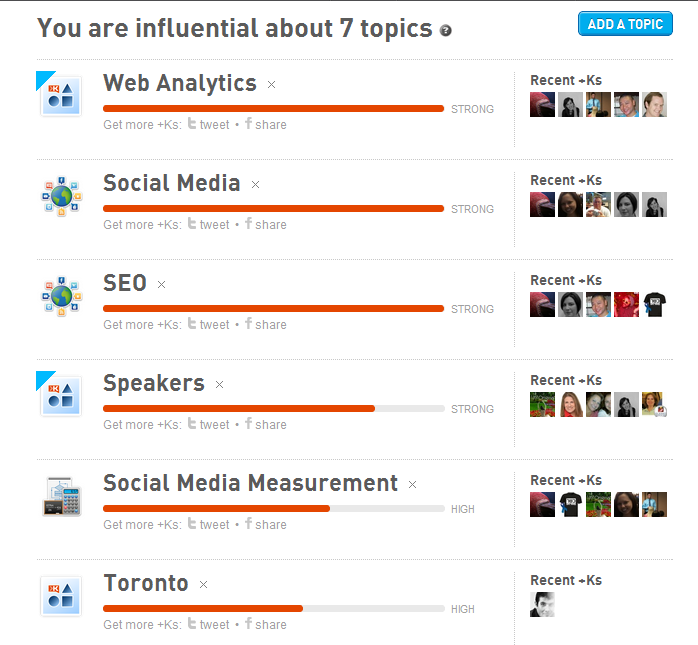 But the key question became what about topics that Klout doesn't find and associate with you. To resolve this issue about 2 months ago, Klout allowed individuals to add topics to their own accounts and to accounts of others. 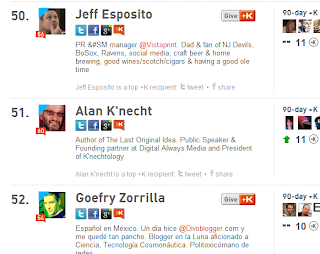 This is a simple process, you simply navigate to the persons Klout Topic page and click on the "Add Topic" button. Of course it will cost you. The cost 5 Klout +K (most people get 5 a day). And now you have a new topic in your (or someone else's) topic list. You can then choose to share this with the world via Twitter or Facebook and then encourage others to agree with you by giving a +K to that topic (a vote in simplest terms). So that's the basic, now here comes the fun part. 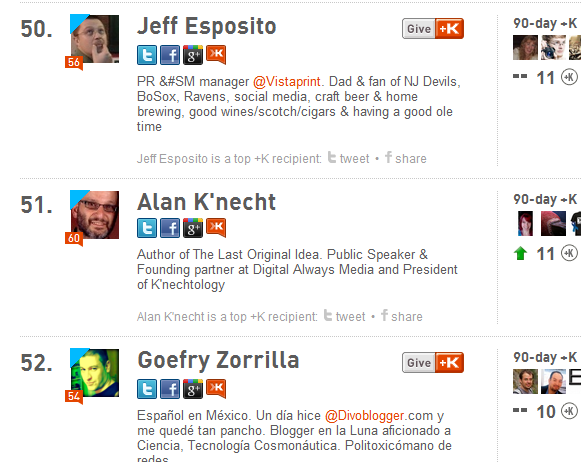 If Klout feels you're one of the top influencers on a given topic they give you a yellow sash on your Klout score and if you're one of the top +K receipients for that topic you get a blue sash. While so far I've only received a blue shash, I was curious as to how Klout determines who gets these. Is it purely a numbers game (the more +K the better) or is it a combination of +K plus some external factors. Faced with this thought, I of course went out to see what I could find. 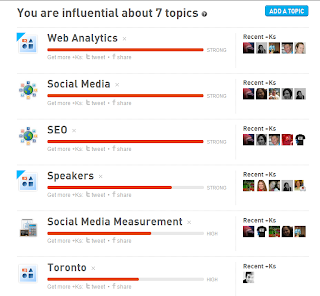 Step 1 - I added a topic to my list of topics "social media measurement". I thought this was appropriate since I lecture on the topic at various conferences and have moderated a few panels on it as well. Of course simply adding the topic didn't generate a sash. Step 2 - I took a closer look at a random sampling of those listed by Klout as top +K recipients and noticed from the ones I looked into that all had the appropriate blue sash with the topic listed. So I concluded that you had to be one of the top 100 to get it. Step 3 - I mentioned my test to a few friends and started generating some +K to the topic of "social media measurement". What I noticed from this is that Klout evaluation of my topic changed from "Low" to "Medium" to "High" and moved the topic up high in the list. There is one further level of "Strong" which I've yet to achieve for this topic (I have for 4 other topics and for 2 of the topics I have a sash) and still no appearance on sash. Step 4 - I looked at the list of top 100 again and noticed that my 9 +K placed me in 65th position. 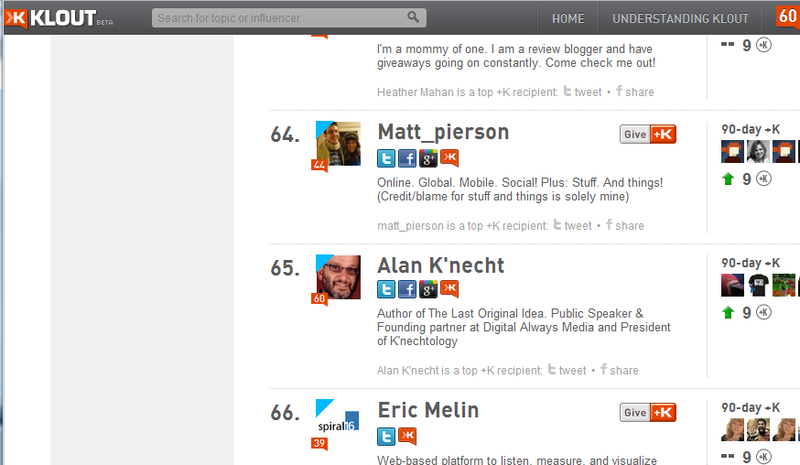 I then checked the +K counts of those 1 above (Matt_pierson) and 1 below(Eric Melin) my listing. 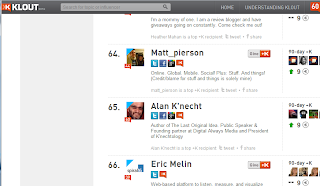 We all have 9+ Ks yet both of them have "social media measurement" listed in their sash but alas not I. I further checked and noticed that Eric Melin (listed below me) had comment of strong while Matt_pierson (listed above me) was also rated as high. So why the difference in ratings for the same number if +Ks? From what I could see, it looks like Matt_pierson received multiple +Ks from same person. While the total +Ks is the same perhaps their is a waiting issue if the same people keep voting for your topic. Yet this didn't affect the order we appeared in so I'll assume it has something to do with timing (most recent to receive 9 appears at the bottom). Based on reviewing these discoveries I have 2 theories. One that it will appear in my sash shortly, but it that might only occur during a major update (not a daily update). Or more likely that Klout is using other factors beyond +K to determine if you truly deserve the topic you'v add or was assigned to you. So for now I'll wait & see what it takes to get "Social Media Measurement" as topic in my sash. Will this truly mean I yield influence on the topic and that people agree that I do or will it mean that I was able to manipulate the opportunity for a more informative sash. Perhaps a little of both. If you'd like to help with this experiment, you can do two things. First make sure to Like, G+ and share this post (scoring tools like that kind of stuff) and secondly go to my Klout topics page and give me a +K on "Social Media Measurement". I'll be monitoring it daily for now, and I'll post back an update when I get rate a "Strong" and if and when it appears in my blue sash.